announced soon, and May 11th (if necessary) at the City College of New York’s (CCNY) Holman Gym. and others – including some who will fly in an airplane for the first time. Pearl” Monroe, while former UCLA and Lakers great Lucius Allen is the coach of Team Los Angeles. their squads and determine which city gets ultimate basketball bragging rights. chance to realize their dreams and get back to the roots of why we love the game,” said Monroe. Battle for Big City Sports Supremacy Starts Off With Basketball Competition Coached By Local Legends ‚”Earl the Pearl‚” Monroe and Lucius Allen. 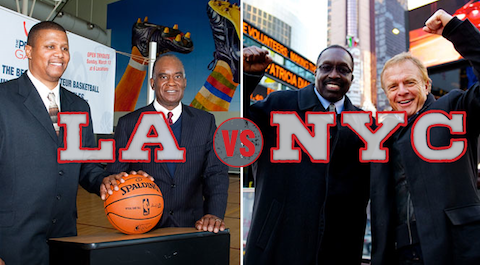 New York, NY & Los Angeles, CA, March 2, 2011 – Those who have dreamed of representing their city in athletic competition now have a once in a lifetime chance at sports stardom. Organizers today announced The People’s Games, a new sports concept that offers athletes the opportunity to represent their cities in competition against other US cities in a battle to prove which city has the best athletes in various sports. The program will launch with a basketball competition and will be played at local venues with local sports legends as team coaches. The People’s Games will tip-off Sunday, March 13th with basketball tryouts throughout New York City and Los Angeles, followed by a ‚”best of three‚” finals series in early May. Home court advantage will be determined by a ceremonial coin-toss. Participants can register for tryouts at www.PeoplesGames.com (or call 800-TPG-3098). The public will also be able to help select their city’s team, participate in a variety of social events surrounding the games, and watch key action from the competition on this site. New York Knicks legend ‚”Earl the Pearl‚” Monroe will coach New York’s team, and former UCLA great Lucius Allen, who played on John Wooden’s National Championship teams and later for the Lakers, will coach the L.A. team. The People’s Games will be conducted in partnership with the City of Los Angeles Department of Recreation & Parks and in coordination with the New York City Department of Parks & Recreation. A portion of the proceeds from The People’s Games will be donated to the local recreation and parks departments in participating cities. In the future, The People’s Games intends to announce additional competitive platforms and participating cities. Armyan Bernstein, award-winning producer and Chairman of Beacon Pictures, is the Founder and Chairman of The People’s Games. Terry Jastrow, seven-time Emmy Award winner, who has produced and directed six Olympic Games, is the Commissioner and Executive Producer of The People’s Games. Unlike professional sports where star players rarely come from the city they play for, participants in The People’s Games must be a resident of the city they are representing, 18 years of age or older, and have no professional experience. Competitors will be selected through neighborhood tryouts to create teams which reflect the heart and soul of the city. For detailed explanation regarding the tryouts and team selection process, visit www.PeoplesGames.com. Final team New York City and Los Angeles rosters will be announced at the end of March.